The purpose of this study was to examine the efficacy of CES for the treatment of anxiety and depression. 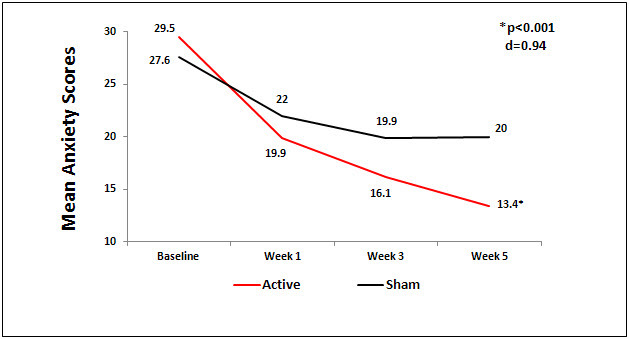 This was an IRB approved 5 week study that used a randomized, sham controlled, double-blind design in which subjects in the treatment and sham groups participated in a daily one hour treatment of CES using active or sham Alpha-Stim CES devices. The sham device was identical to the active CES device, except it did not conduct an electrical current. The active CES device was set to 100 µA, a subsensory level. The subjects, investigators, physicians and staff were all masked as to the identity of the device. The primary effectiveness endpoint was the change from baseline in the last post-treatment scores on the Hamilton Anxiety Rating Scale (HAM-A) compared to the sham treatment at the endpoint of the 5 week study. The secondary outcome measure was the change from baseline in the last post-treatment scores on the Hamilton Depression Rating Scale (HAM-D17) compared to the sham treatment at the endpoint of the 5 week study. • Male and female participants between 18-65 years of age. • Diagnosis of an anxiety disorder was verified by a licensed clinical psychologist in an interview using the DSM-IV criteria. • Must score > 15 on the HAM-A. • Score on HAM-A must be higher than score on the HAM-D17. • If on antidepressant medication, the medication and dose must be stable for at least 3 months before entering study. • Must be in good health; chronic medical conditions must be stable. • Use of Benzodiazepines more than twice per week. • Met DSM-IV criteria for an Axis I diagnosis, other than an anxiety disorder. • Participant judged by investigator to be a risk for suicide or has attempted suicide one or more times within the past 12 months. • Current alcohol or substance abuse. • Participants exhibiting a psychiatric condition that would require inpatient or partial psychiatric hospitalization. The Alpha-Stim CES active and sham devices were randomized by the manufacturer and the devices were packed in the device box in the order which they were to be assigned. Subjects were assigned a device based on the order the devices came out of the box. Baseline measures were done prior to the first CES treatment. 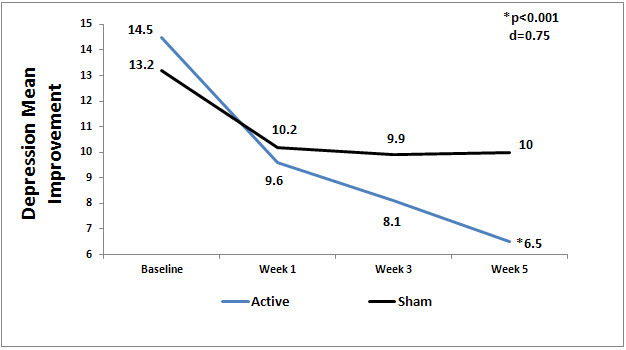 Subjects had 5 weeks of daily CES treatment for 60 minutes with either an active or sham device. Outcome measures were done at the end of 1, 3 and 5 weeks. The active CES device was pre-set and locked by the manufacturer at 100 µA which is a subsensory level. The sham CES device was pre-set and locked by the manufacturer so that it did not emit electricity. The length of treatment, 60 minutes, was also pre-set and locked by the manufacturer for both active and sham devices. The Hamilton Anxiety Rating Scale was used to quantify the severity of anxiety symptoms and to identify the response to CES. It has established reliability and validity in the literature (Maier et al., 1988). The Hamilton Depression Rating Scale17 (HAM-D17) was used to quantify the severity of depression symptoms and identify the response to CES. It is has established reliability and validity in the literature (Cusin et al., 2009). Pre-specified criteria for success was set at ≥50% improvement for anxiety and ≥50% improvement for depression. A power analysis was done and indicated that for two groups and at least one covariate that 107 subjects were needed for an ANCOVA analysis, an effect size of d=0.50 and p=0.05. Of the 115 subjects who enrolled in the study, 108 subjects completed the study. There were 57 subjects in the active CES group and 51 subjects in the sham CES group. There was no statistically significant difference at baseline between active CES and sham treatment groups on anxiety, depression and subject characteristics of age, gender, use of prescribed medication and type of anxiety or depression disorder. There was a significant difference between the active and sham groups for anxiety from baseline to endpoint of study (p<0.001, d=0.94). The HAM-A scores decrease in the active group of 16.14 (29.51 to13.37; 54.6%) was more than 2 times the mean decrease of 7.58 (27.56 to 19.98; 27%) on the HAM-A for the sham group (See Figure 1). Eighty-three percent (83%) of the active CES group had a decrease of ≥ 50% decrease in anxiety scores on the HAM-A from baseline to endpoint of study. Note: All subjects must have met DSM-IV criteria for anxiety and scored > 15 on the HAM-A to be included in the study. There was a significant difference between the active and sham groups for depression from baseline to endpoint of study (p<0.001, d=0.78). The HAM-D17 scores decrease in the active group of 8.04 (14.5 to 6.47; 55.4%) was more than 2.3 times the mean decrease of 3.26 (13.22 to 9.96; 24%) on the HAM-D17 for the sham group (See Figure 2). Eighty-two percent (82%) of the active CES group had a decrease of ≥ 50% decrease in depression scores on the HAM-D17 from the baseline to the endpoint of study. This is a strong study that used a randomized, sham controlled, double-blind design and was adequately powered. Active and sham Alpha-Stim devices were pre-set and locked at the designated levels for each specific group (active or sham) to maintain the current level and treatment time by the manufacturer. Sham devices were the same as active, except they did not emit electricity. Randomization of devices was done by the manufacturer and followed according to the protocol by the investigators. Individuals had to meet the DSM-IV criteria for an anxiety disorder to be in the study. Pre-specified criteria for success were established for the study. CES treatments were done daily for 60 minutes for both active and sham groups. ANCOVA was the appropriate analysis for the data on anxiety and depression. All subjects (N-108 at end of study) completed the HAM-D17 at baseline and endpoint of study. A limitation of the study is that the number of individuals within the total groups who met the DSM-IV criteria for depression was small (12 in the active CES group and 11 in the sham group), however the total active CES group had significantly lower scores on the HAM-D17 from baseline to endpoint of study than the total sham CES group (p<0.001, d=0.78). The range for no depression is 0 to 7 on the HAM-D17, so there was ample room for subjects who did not have depression to have lower scores on the HAM-D17 at endpoint of study from CES treatments. This is most likely what happened. Subjects in the active CES group who had depression scored significantly lower on depression scores at endpoint of the study indicating less depression. Subjects in the active group who were in the “no depression” range on the HAM-D17 had lower scores at endpoint representing an improved mood status. Barclay, TH. Associate Professor, Department of Psychology, Liberty University, Lynchburg, VA; Barclay, RD. Associate Vice President for Analytics and Decision Support at Stetson University, Daytona Beach, FL. Cusin C, Yang H, Yeung A, Fava M. Rating scales for depression. In L. Baer, MA Blais (eds,) Handbook of Clinical Rating Scales and Assessment in Psychiatry and Mental Health, Current Clinical Psychiatry. New York, NY: Humana Press, 2009. Maier W, Buller R, Philipp M, Heuser I. The Hamilton Anxiety Scale: reliability, validity and sensitivity to change in anxiety and depressive disorders. Journal of Affective Disorders. 1988 Jan-Feb;14(1):61-8.